To drive more impact with your flows, make sure the flow is targeted to the right people, in the right place, at the right time. User targeting for your flows starts on the settings page. From there, you can define where you want your flow to display, the audience who will see it, and what happens upon the flow's completion. This information is also available in video form in the user targeting webinar. This section dictates where your flow will appear when it's published. Which page should we show this flow on? To display your flow at any URL within your platform where Appcues is installed. Use this targeting to display your flow at one, or multiple specific URL paths. A path is anything after the ".com" (or ".xyz", etc.). Lets take this exact URL for example, since its pretty simple in structure. Have dynamic URLs? Learn more about publishing flows to dynamic URLs. Specify which domain(s) this flow should appear on. If you need to add a new domain, you can modify the list. Learn more about domain targeting here. Show the flow one time to those who meet your 'Audience' and page targeting. The flow will not relaunch to the same person, even if the flow has been unpublished, edited, and republished again. ProTip: If you need to display a "show once" flow again (including those that have already seen it), clone the flow from the dashboard. The cloned flow will look identical, but will not have any of the user history. It is a tooltip or hotspot flow that has multiple steps: if a user does not complete all steps, the remaining (unseen) tooltips/hotspots will launch the next time they visit the targeted URL. If the flow is being viewed via permalink: permalinks override targeting, and will launch a specific flow each time they are clicked. This will launch the flow every time someone meets the targeting criteria (determined by your other display or audience settings). ProTip: Use this option in conjunction with the "Show only to my team" setting (see "Audience" section below) to create a testing environment for a flow. When you'd like a flow to only launch from the widget. When building a choose your own adventure style flow. When launching a flow via permalink. The audience section defines who will see your flow. Who should see this content? All users: show this flow to all users in your platform. Users in a segment (recommended): specifically target one of the segments in your account. We recommend segments because they allow you to create a more focused message, and you're able to get a sense of what messages are being sent to what segments. 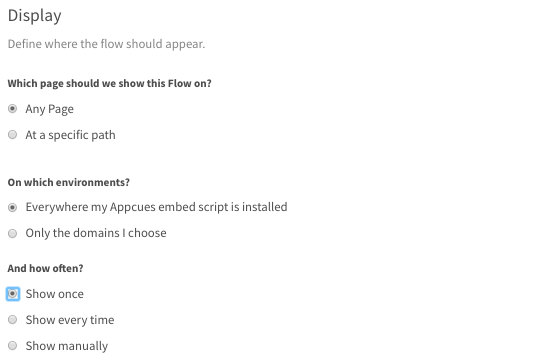 Show only to my team: show your flows to teammates in your Appcues account (useful for testing). A user must be logged into Appcues to see flows when this is selected. One of Appcues' more advanced features is A/B testing. As you learn more about how your customers interact with your flows, you can use A/B testing to learn even more! The best way to utilize this feature is to compare how one flow performs against another. Are you users more likely to engage with a slideout containing a gif or a static photo? Do you users like a tooltip tour, or would they prefer one modal containing all content? You can use A/B testing to learn exactly this! The property that Appcues will send over is called _ABGroup, and the value will either be depending on which group the user was assigned. We generate this property, and whichever A/B group a user is assigned persists on his profile and will remain the same. If this sounds like jargon to you, don't fret. We geek out about analytics and are happy to help—reach out! Check the "Enable A/B testing" box to show the flow to a random 50% of your user base. This random bucketing is done for you, and you can also test two flows against each other by selecting Group A for your first flow and Group B for your second. To properly analyze the results of your A/B test, we suggest integrating Appcues with a third-party analytics system. Those systems will let you see your results in a larger context and provide reporting features designed for this kind of analysis. You can also view the results within Appcues, by comparing the Analytics page for each flow. Completed a "Flow Started" event for the flow in question. Were either in Group A or Group B, depending on which you want to analyze. Most systems will let you view that segment in funnels and other types of useful business reports. Give it a try and let us know what you think! To accurately measure the efficacy of your experiment, you'll first need to enable one of our third-party integrations and have the ability to segment users by their properties. The goals section is where you can measure the success of your flows, based on what users accomplished after seeing it. No Goal: will only track views and completion of a flow. Choose an existing goal: saved goals will appear in a drop-down list in your flow settings. Define a new goal: create a new goal to measure. When a goal is created from this screen, it will automatically be linked to the flow, and the goal results will appear on the flow's analytics page. Learn more about how goals work and how to create them. What should we do when this Flow has completed? Trigger Appcues content: will launch a separate Appcues flow. You can use this feature to link multiple flows together.